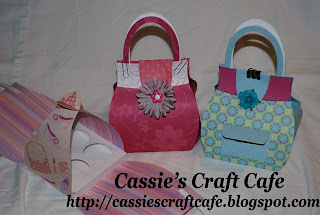 Good Evening Family, Friends, and Fellow Crafters! Sorry for the late post, especially since this project was finished 2 days ago. In keeping with my theme to try new things this month, I did my first Waterfall Card. I know this style card is old to some of you, but it made my to do list last year, and I never got around to it. This project also doubles as an entry over at Celebrate the Occasion, this week. Also this week, I tackled another exploding box. These are really addictive. This one doubles as a card and mini album to celebrate my friend, Karen's birthday. I stayed up to some wild hour Saturday morning until I found a way to get this cake slice to stand up. I can't even tell you where I found the stand and how many times I cut and resized it, but I was so pysched when it was done, that I stayed up another 40 minutes watching tv, to calm my excitement. LOL! I cut the stand using chipboard, then covered with paper. The bottom base and cake plate were cut with regular paper. I then took some Martha Stewart's decoupage sealer and brushed some on the bottom on the stand then adhered it to the base. Hold it place for a minute and tadaa! this paper is from a K & Co paper stack. 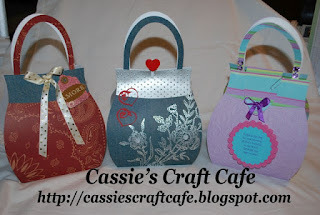 While cruising CTO's Blog Hop this past weekend, I came across a beautiful cut file by Cre8ive Cuts. I fell in love but debated purchasing. Why, since it's only $0.99 cents? I don't know but I came around fast and now I'm knee deep in cutting Valentine purses for several recipients. I'm showing the in progress pictures, because I will not make the cupcakes (to go inside) until Sunday night and I have a busy weekend ahead of me. So, look past the binder/paper clips and see the project. LOL!! The inside holds 4 mini cupcakes. Thanks for stopping by. 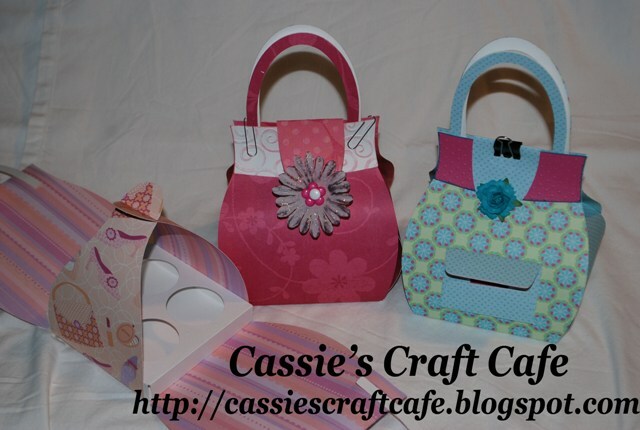 Hello Family, Friends, and Fellow Crafters!!! This month I am celebrating a few firsts. I am setting out to try a few techniques or projects that I've never done before. Some have been on my list for awhile now, so let's get to the first one. My 1st project this month is an Explosion Box. I've been wanting to do this for over a year now. After the first one, I was hooked. I am going to use some of these as cards this year, instead of a traditional card. The first one below is a thank you card. This also doubles as an entry to this week's challenge over at Celebrate the Occasion this week. I want to thank so many individuals who have supported and encouraged me in this crazy craft world that I love so much. My hubby and kids, my dad, my sister and bff, my friends, my crafty sisters, & LJ (who introduced me to scrapbooking as an art). I also made one for a birthday. The recipient will be able to add pictures from her birthday celebration as well as a little journaling.